Dunbar was on the main route from England to Edinburgh so invading armies on their way to Scotland's capital inevitably left their mark. Of course, the English were not always successful - Black Agnes, Countess of Douglas, successfully defended the castle against a besieging English army in 1338. She reputedly dusted the battlements ostentatiously whenever they were hit by a missile from the siege guns. The 11th Earl of Dunbar was accused of treason and forfeited the castle and it was destroyed in 1488 but was rebuilt by King James IV. The Duke of Albany took over the castle and refortified it to withstand cannon fire in 1515 but it was set on fire by the English in 1548. In 1566, Mary Queen of Scots and her husband, Lord Darnley, arrived at the castle two days after the murder of Mary's secretary, Rizzio. Darnley was suspected of being imlicated in the murder of the Queen's favourite. 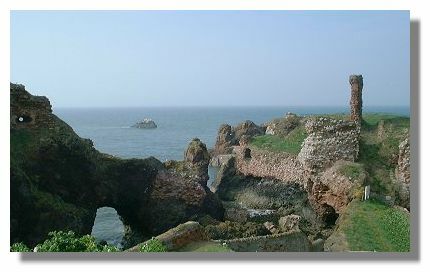 Then in 1567, ten weeks after Darnley himself had been murdered, Mary was abducted by James Hepburn, 4th Earl of Bothwell and brought to Dunbar Castle. Bothwell was the keeper of the castle at that time. Many of the stones from the castle were used in the 19th century to build the harbour at Dunbar - conservation was not as big an issue then as it is now. The ruinous state of the castle means that public access is not permitted - so hundreds of seagulls live there instead. or go to the next castle: Dunbeath Castle.